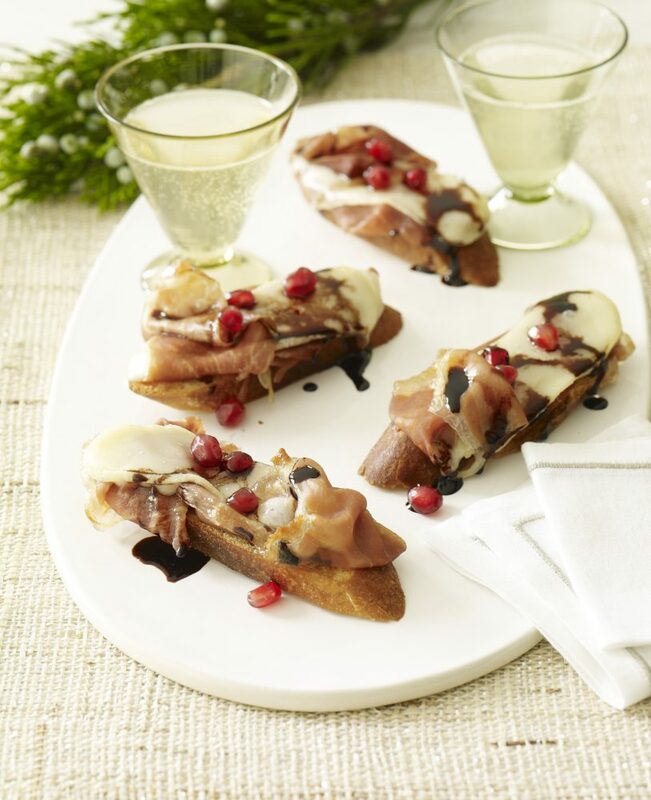 Offering an abundance of flavors and very short prep time, these delectable little toasts of prosciutto and cheese are ideal for special autumn gatherings and all year round snacking. The antioxidant rich pomegranate provides a bright burst of color and the melted Robiola adds some finesse. They’re quick to assemble, small enough to hold in one hand with a flute of Prosecco in the other. Multi-tasking was never so delicious for this prosciutto and cheese masterpiece! Heat vinegar and pomegranate juice in a medium saucepan over medium heat. Bring to a simmer. Let simmer about 4 minutes until reduced to 3 tablespoons. Remove from heat; set aside. Heat broiler. Cut bread crosswise into 3 pieces so you have 6 pieces. Brush cut side with oil. Place on baking sheet cut side up. Broil 2 to 3 minutes until lightly toasted. Remove from oven, then top each bread slice with cheese and prosciutto. Broil about 2 minutes, just until cheese is melted. Remove from bread oven. Sprinkle with pomegranate seeds and pomegranate balsamic reduction. Serve hot. *If you can’t find robiola, use another Italian melting cheese such as taleggio.